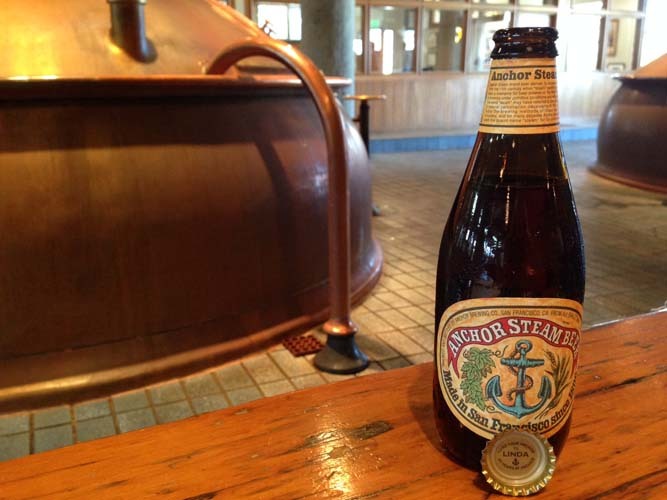 Amidst the pillars that support the iconic and historic Anchor Brewing Company, there is a rock. The rock is Linda Rowe, Director of Finance and Administration. 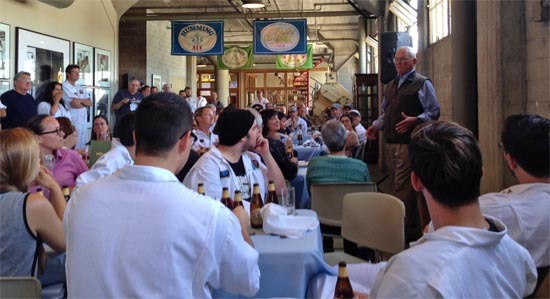 “She is the business rock that we built the brewery upon,” stated Fritz Maytag during Linda’s recent all-brewery celebration luncheon. “I didn’t make a business decision without asking her first,” he added. 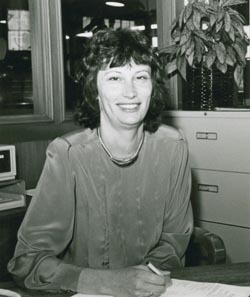 Fritz praised Linda’s hard work as well as the efforts of other original Anchor employees, including Gordon MacDermott and Mark Carpenter. 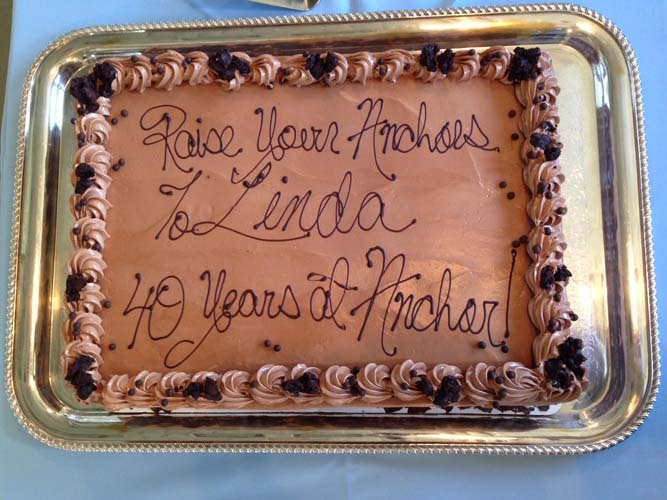 On July 22, Linda celebrated her 40th anniversary at Anchor, still smiling as if she knows something everyone else does not. 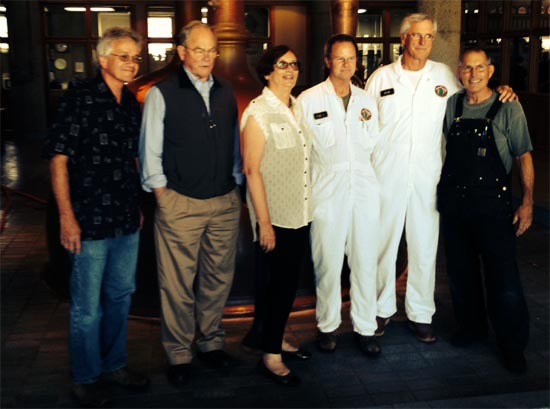 In honor of the occasion, owners Keith Greggor and Tony Folio dedicated all remaining 2014 Anchor Steam Beer bottle caps with the underside inscription, “Raise Your Anchor to Linda – 40 Years at Anchor,” and the crown inscription, “LR-40.” Only four people have had their initials on the crown before: Gordon, Mark, Chris Solomon, and Linda. 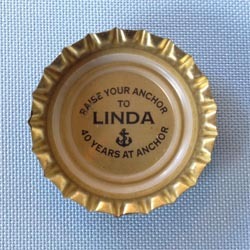 Linda is the first to have her name on the bottle cap. Ever the deflector of praise, seeking attention was never Linda’s style. Her father had given her simple advice, “do the best job you can every day,” and she followed it. She put her passion into her work, which withstood the scrutiny and praise of four decades. 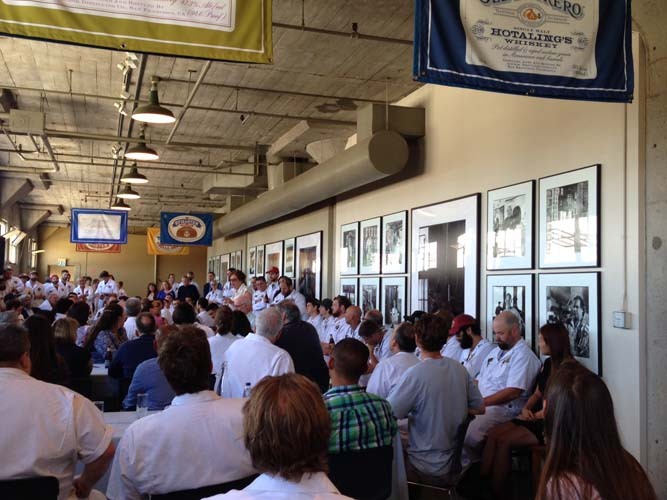 Many told stories of careers launched and nurtured by Linda. 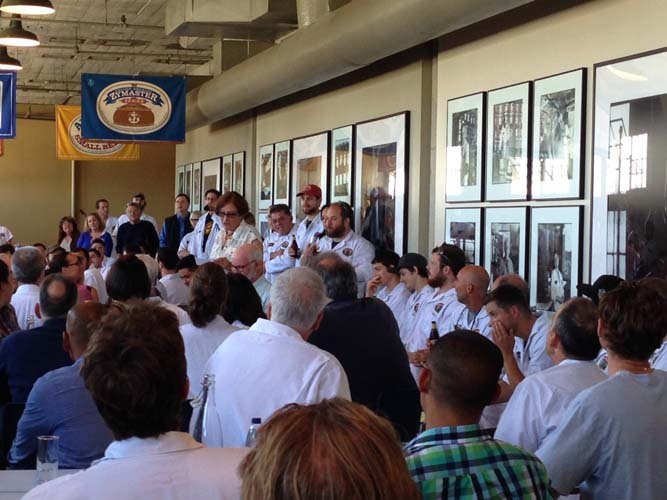 Debora Pinkas, now a lawyer, mentioned how she had called the brewery with no idea of what job she might do. When Linda answered the phone, Debora panicked and said, “Um… I want to be a tour guide,” to which Linda calmly replied, “Great timing, we actually need a tour guide.” With emotion, Debora said, “Linda was the first person to actually take me seriously,” noting how that had changed her life. Yet even behind these examples of Linda’s impact lay silent backstories of all that Linda had done for Anchor. 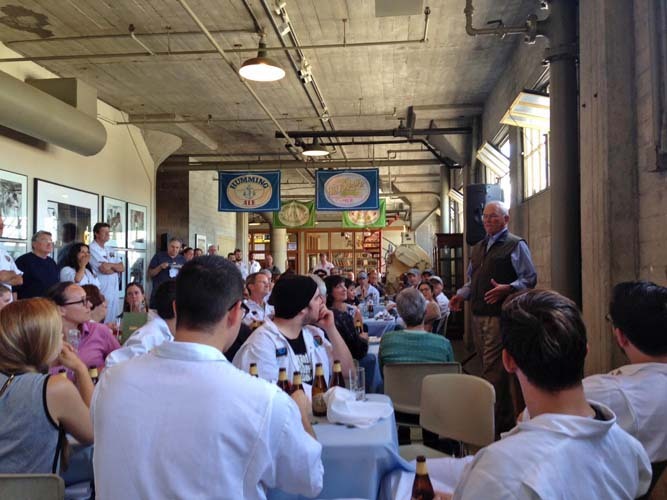 Back at the former 8th and Bryant brewery location, there were no formal tours. Linda’s desk happened to be near the brewery entry, and whenever someone entered the brewery asking for a tour, Linda would stop her work and selflessly guide the guests around. 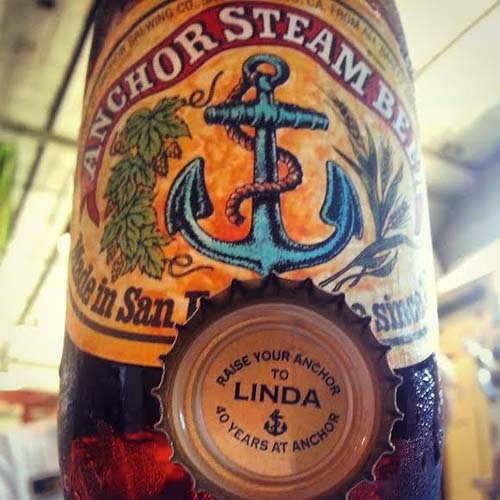 Linda was originally drawn to San Francisco from her home in Connecticut by the lure of the hippy movement in the 1960’s and 70’s. Surprisingly, she felt that “the culture wasn’t that different from what was happening in Boston back then. 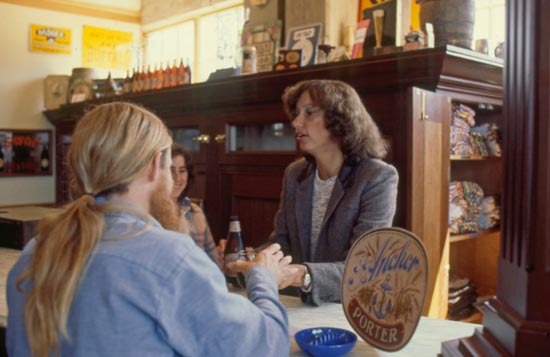 It was just the hippy movement.” She figured she would stay in San Francisco “about six months,” but then fate stepped in. 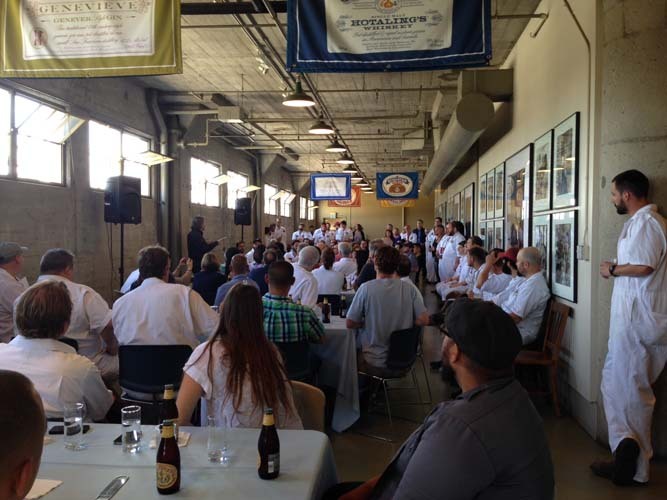 Amidst many interviews that a placement agency had scheduled, most which she found uninteresting, one stood out: “A bookkeeper position at a brewery… it sounded very interesting,” said Linda. Last Friday as I left work and walked by the Accounting and Finance offices, I noticed Linda staying late as always. Her unassuming desk was filled with decades of faithful work haphazardly scattered about. At the corner of her desk sat a plain plastic cup, filled to the brim with inscribed Steam bottle caps. Small trophies symbolizing a giant accomplishment. I Salute you Linda Rowe !! It is truly a Good work you have done during all these years . I Love this Beer !! Congratulations, Linda! Just opened a bottle with your special cap and had to look up the story. 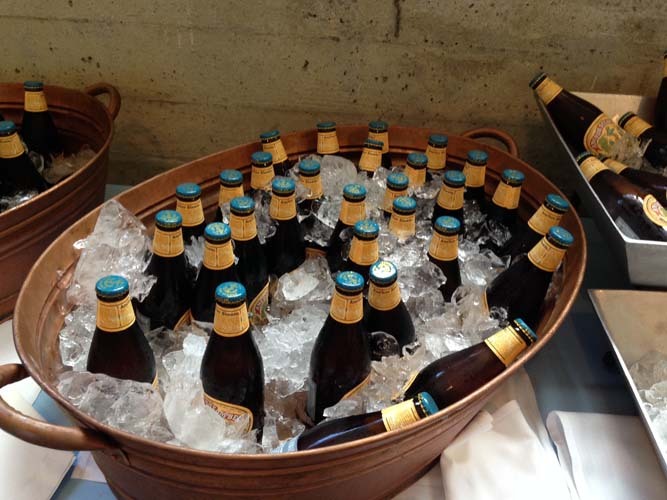 Thanks for all your hard work for our favorite beer.